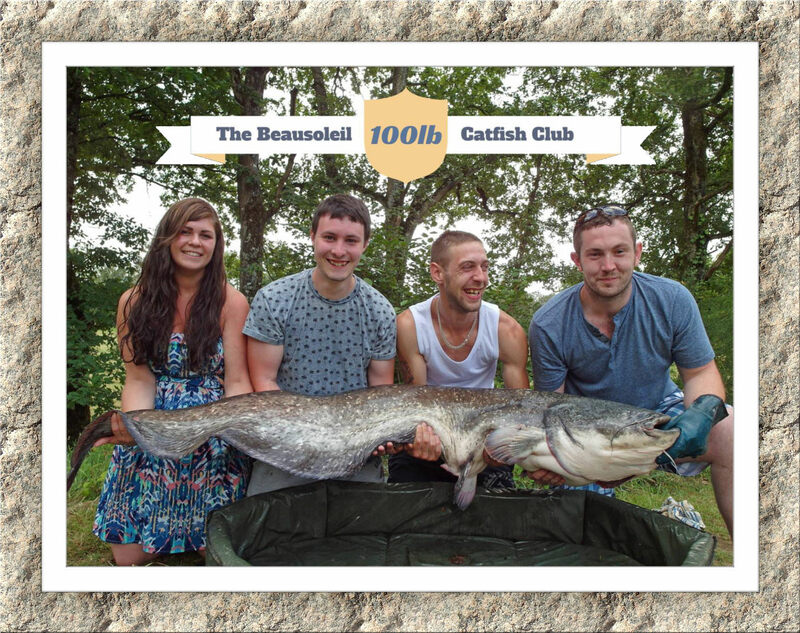 First 100lb catfish at Beausoleil and new lake record! 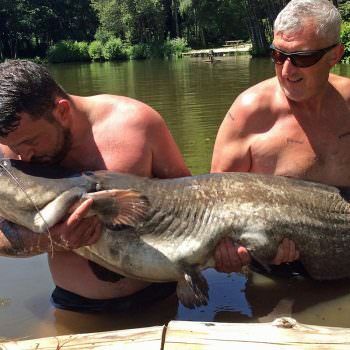 100lb+ freshwater fish are rare, very rare and to catch such a catfish from a small 4 acre lake in France on a carp rod takes some doing I can tell you! Our catfish lake record of 95lbs has stood since 2011. It was set by our very first guests to the venue by Chris on his very first trip. Ever since then, we’ve been waiting for one of our monsters to break the 100lb mark and it’s finally happened! What’s even more amazing is that I was there on site, visiting our guests, when the catfish was landed! It was Allan’s first trip to the venue and he openly considers himself a novice carp angler as he has spent most of his life sea fishing. 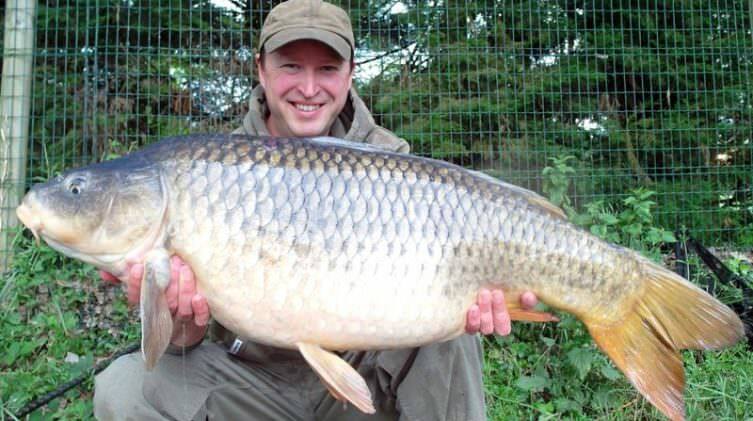 He started carp fishing a couple of years ago and was very excited about meeting some of whiskered friends too. Out of the four members, it was only Allan that had the strength to fish the first night and his efforts were rewarded with a 20lb kitten (his first ever catfish, much to his delight). A couple of days passed before he met one of our real catfish. An 82lber monster which he was convinced would be his PB for some very considerable time. Little did he know that just a couple of days later he would smash that PB by a big margin. After lunch on Thursday, the team were all eagerly working away setting the rods for the afternoon/evening session. Allan had moved swims and had decided to run a rod out of the big double towards the island point gravel bar about 10m off the point. His rig of choice was the catfish version of my Beausoleil rig constructed from the super tough 45lb Quicksilver. 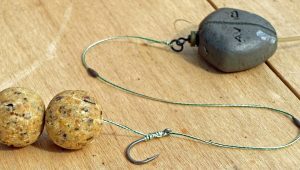 Hooks were wide gape X in size 4 and bait was double Blue Oyster. The rig was about 12” long. 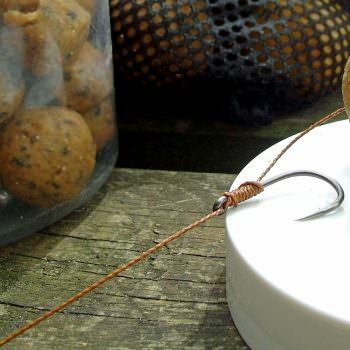 Allan added a 1kg mix of boilies and pellets to the bait boat hopper and sailed it the 30 or so yards to the mark. I hurtled round the other side of the lake to get to the boat as fast as my legs would carry me. I knew that if the catfish decided to make a dive round the back of the island this could be a very short experience for Allan. I launched the boat, jumped in and rowed hard for the island point. I shouted to Allan for an update and fortunately the catfish had decided to head down the back channel. I rounded the island point carefully and turned the boat round so I could see what I was doing. The cat had already made it half the length of the island but there was enough space for me to row down the margin and position the boat in between the island bridge and the catfish. The catfish responded instantly and changed tack, this time heading back towards the island point. Some more furious rowing enabled me to cut him off before he made it. On the rod end, Allan was taking himself and his gear to the max and beyond. 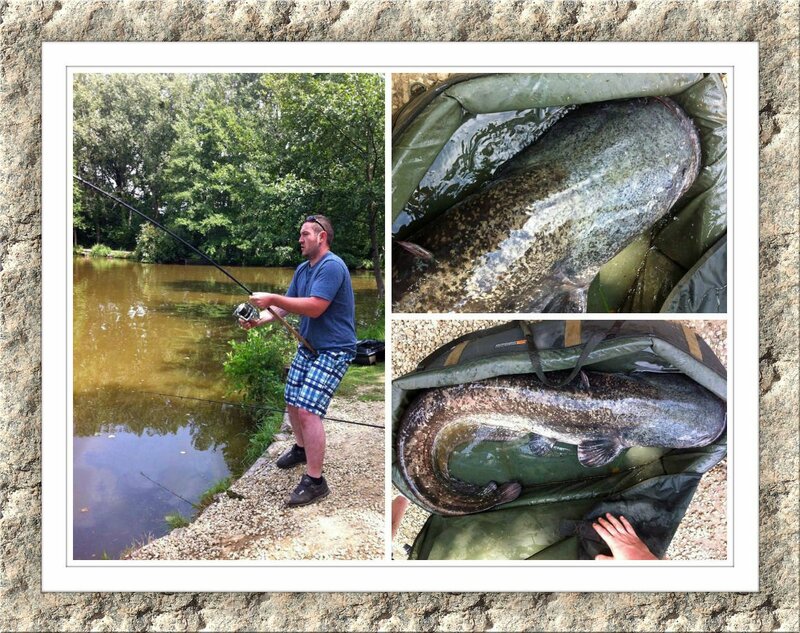 Allan’s a very well built man of 110kg + and was showing this catfish exactly who was the boss here. Allan’s friends were all there to witness the spectacle and help in any way that they could. Lucy managed to take some great footage and pictures of the battle. I’d seen the cat already and knew it was big but estimating its size from the few glimpses I had was pointless. 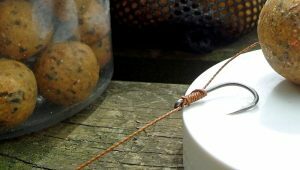 Tom stood ready with a 42” net but I was pretty convinced that there was no way on earth it could be netted even tail first. Andy had the better plan and was all gloved up and ready to haul the beast into the mat. I stationed myself in the boat just a few meters in front of the catfish blocking its exit route from the bank towards open water. Andy knelt down and declared that he’s never gloved a catfish before. 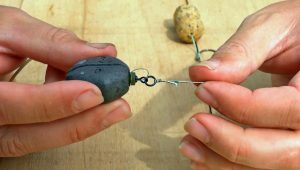 This fact didn’t deter him in any way from the task and he wrestled with the cat a number of times trying to jam his fingers behind the bottom pad and into the cavity that the catfish can open and close at will. 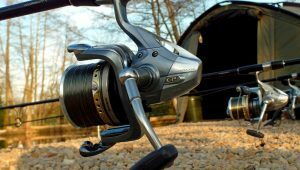 Once solidly gripped, much to my amazement, Andy just hauled with all his might and the catfish was wrenched from the water safely into the confines of the massive cradle (the new Fox XL cradle which is just about big enough!). Andy’s an amateur kick boxer and strained every sinew of his body to get that cat out of the water. I know for a fact that it would have been a two man job for most guys. We all cheered of course and busily set to with the weighing gear and poured plenty of water over the cat to keep him cool. Our first reading on the scales was 96lbs, wow a new lake record! Then Andy shouted that the sling was still resting a corner on the mat: 96lbs and we still hadn’t felt the full weight of it! A quick adjustment enabled us to balance the cat better and we saw the needle flutter equally either side of the 100lb mark! The whoops and cheers could probably be heard across the fields as we all congratulated Allan on this incredible feat. It’s a memory that will live with us all for many years to come and one that Allan will never forget. Our lake is only one of a handful of lakes in France to hold 100lb plus catfish and so landing one puts you in a very exclusive club indeed. 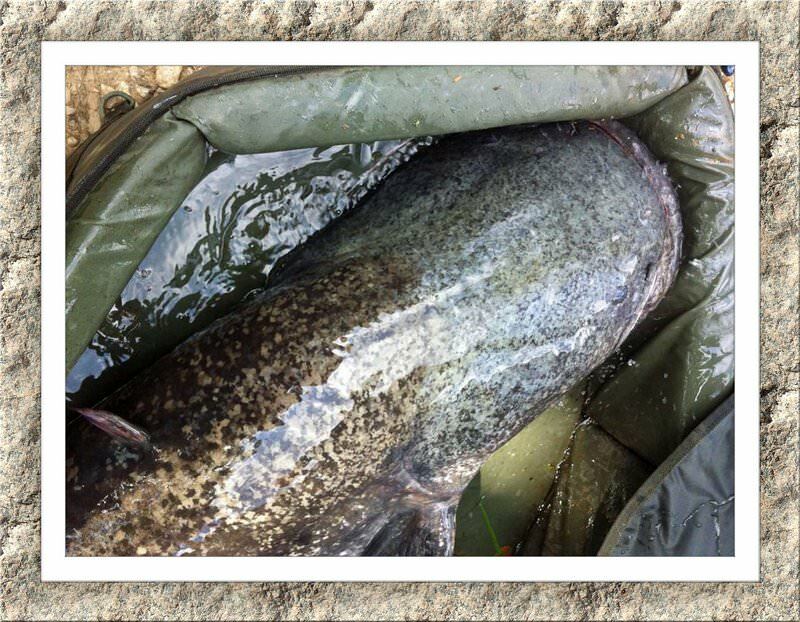 In honour of the momentous event we have created our very own 100lb catfish club and Allan is the founding member! As many of you may know, we name all our 30lb + carp but due to the difficulty of identifying the different specimens we don’t name the big catfish. 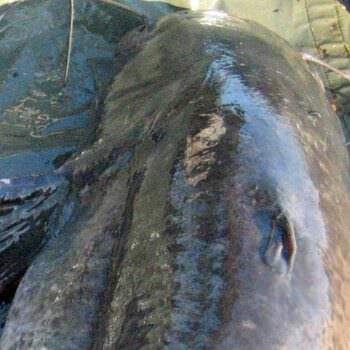 However in this case we can do it as this 100lb catfish has a uniquely coloured massive green head. I’m confident of its uniqueness as I remember seeing it during the winter netting. As first capture, Allan got the honour of naming it and it will now forever be known as Boris! Our mission here, at Beausoleil, is to enable guests to create magical memories like these. It’s a job we take very seriously and we have a huge amount of passion for. What’s truly magic is when our guests fall as deeply in love with the venue as we are. Well done Allan and thanks for the magic. Previous Post - My first 30lb river carp!